Attaché provides the ultimate mobile storage solution for people on the go. Working on a presentation and need to take it with you? Want to share a new song, pictures, or video with your friends? Simply copy the file onto Attaché and take it with you -- put it in your pocket, wear it, put it in your backpack or briefcase and you're good to go. To access your data, simply plug Attaché into virtually any PC or MAC -- without the need for bulky cables or adapters. Access your files. Anytime. Anywhere. While it might not be the fastest out there, coming in at around $40 at most stores online it?s relatively inexpensive, sure there are 16gb drives that are priced less, and many more that are priced higher though, with those other drives though we don?t know how they compare just yet. While the Lady Attaché looks stylish, we were disappointed that it doesn't offer any extra functions. 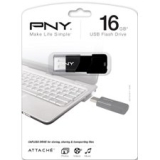 I like PNY flash drives because the USB connection port does not try to slide into the storage slot when one plugs it in teh computer port like the sliding storage style drives. Never had a problem with this brand. This seems to be a decent USB flash drive and PNY has always had great drives but the rub on this design is that every time I try to push it into a USB slot it try's to close the cover. Simply a poor design to me. I always forget and it does it a lot. Will try a different design next time. I was able to get all of my pictures on here. Plus, I like the way it comes out to attach to the computer. This is my third PNY Attache 32GB USB 2 Flash drive, and the two previuos flash drives have been my main workhourses for uploading 24-28 GB of installation files for applicaitons. I wanted to replace my traditional hard drive with an SSD. The speed increase and lower power consumption was nice. I am using this as my root (OS) drive. The time has come to ditch the older style drives. Good speed and seems to work just fine. I had to figure a way to save photos and these work great! I have had pny drives earlier with no problems. This drive seems to have a lot of problems being recognized. A few other drives Other manufacturers) function properly. I also had a 2gig drive (pny) fail after only short time. I am leaning to not buying PNY drives anymore.